Have some thoroughly green evil fun! This wickedly inventive guide explains how to create a variety of practical, environmentally friendly items you can use for yourself or resell for profit. 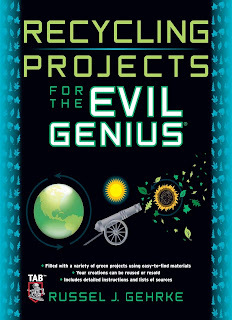 Recycling Projects for the Evil Genius is filled with detailed directions on how to successfully complete each green project and discusses important safety issues. Using easy-to-find components and tools, this do-it-yourself book shows you how to brew up green cleaners, transform all types of paper into building materials, safety rid your home and yard of pests, and much more--all on the cheap! Pasar un divertido mal rato completamente verde! Esta guía de perversamente inventiva se explica cómo crear una variedad de artículos prácticos, respetuosos del medio ambiente que puede utilizar para usted o para revender con fines de lucro. Proyectos de reciclaje para el Genio Malvado está llena de instrucciones detalladas sobre cómo llevar a cabo con éxito cada proyecto verde y discute cuestiones importantes de seguridad. Uso fácil de encontrar componentes y herramientas, este libro de hágalo usted mismo le muestra cómo preparar a los limpiadores verdes, transformar todo tipo de papel en los materiales de construcción, la seguridad de librar su hogar y el jardín de las plagas, y mucho más - todo barato! My Shade of Green. Tell Me About the Good Ol’ Days. Out of the Box. It’s a Brick House. Paper or Plastic?. Safer Chemicals. Mean Green. My Shade of Green. Recycling the Good, the Bad, and the Ugly. Collection. Which Way Did It Go?. Buried Treasure in Our Trash. Recycling Half-Truths. Wants versus Needs. Recycling and the Poor. When Recycling Goes Down a Questionable Path. Re-recycled Investment. Recycling Your Waste Stream at Home. Cash in Your Trash. Greening Up Household Cleaners. What We Are Cleaning. How Do Cleaners Work?. What’s in Dirt?. What’s in Dust Besides Dirt?. What Makes Things Stick or Stain?. Can’t You Smell That Smell?. Raising a Stink. Smoke Odor Tips. Refrigerator Odor Tips. Garbage Disposal Odor Tips. Basic Cleaner Types. Store-Bought Cleaners and Their Potential Dangers. Hidden Dangers of Cleaners. It’s a Bird, It’s a Plane—No, It’s a Superbug. To Air Is Human. It’s a Wash. A Little Big Deal. Take Control. The Easy Life. Your Shade of Clean. Greening Up with Safer Pest Controls. Weed-Free Lawns?. Good Weed. The Pest Things in Life Are Free. Pest Recognition. The Pest Offense Is a Good Defense. What’s Bugging You. The Buzz on Pesticides. Some Groups of Chemical Products Considered to Be Pesticides. Pesticide Usage Tips. Pesticide Storage Tips. Pesticide-Free Pest-Control Tips. Pest-Control Goals. Recycling Plastics and Composite Projects. Two Characterizations of Plastic. What Is What?. Ode to the Code. Number 7 Plastics: Miscellaneous. Risk Management. Board with Plastics. Products Made with Recycled Plastics. Make Your Own Wafer Board–Style Plastic Lumber. Mass-Production Method. Make a Square Panel Out of Your Plastic Wafer Board. Make a Birdhouse Out of Plastic Lumber. How to Use It. Make a Recycled-Plastic Landscape Block. The Plastic Recipe. Mass Production. Make Recycled-Asphalt-Shingle Paver Bricks. Background. Summary of the Invention. Make a Road-Patch Compound from Recycled Asphalt Roofing Shingles. Potholes. How to Use Your Road-Patch Compound. Recycling Paper and Cardboard Fiber Projects. Farm-Fresh Paper. Pulp Friction. Paper Cuts. Types of Paper Found in Our Homes. The Paper Trail. Make Concrete Papier-Mache. Mass Production. Safety First. First Aid for Contact Chemical Burns. Protect Your Eyes. Waterproofing. Make and Use Landscape Block Molds. How to Use the Mold. Build a Concrete Papier-Mache Landscape Wall or Raised-Bed Garden. Make a Concrete Papier-Mache Shed or Animal Shelter. Make a Large Concrete Papier-Mache Planter. Make a Concrete Papier-Mache Flower Pot or Decorative Bowl. Make a Concrete Papier-Mache Birdbath. Location, Location, Location. I Thought I Saw a Tweety Bird. Make Concrete Papier-Mache Stepping Stones. Make a Concrete Papier-Mache Stepping Stone Walkway. Make a Concrete Papier-Mache Tabletop. Solar-Powered Compost Projects. Compost. Requirements for Organic Decomposition. Materials for Composting. Materials to Avoid in a Compost Pile. Location. Preparing the Compost Pile. Use of Compost to Improve Soil. Charcoal Is Also Beneficial for Soil. Make Your Own Garden-Friendly Charcoal from Biomass Waste. How to Use Your Charcoal. Make a Shopping Bag Composter. Solar-Powered Bag Composter. How to Use It. Build a Barrel Composter. Diagnosing Composting Problems. Build a Raised-Bed Composter That Turns into a Garden. Build a Solar-Powered Compost Tea Brewer. Compost Tea Tips. Clean with Green Projects. Cleaners. Anatomy of a Cleaner. Laundered Money. Cut Your Cleaning Cost by 90 Percent or More. Home Basic or Base 50:1 Concentrate. Make Your Own Rain Barrel. How to Use Your Barrel. How to Make or Find Your Surfactant (Soap). Making Soap (Surfactant). Where to Find Lye (Sodium Hydroxide). Alternatives to Waste Fryer Oil. Making a Concentrated Base “Basic” Cleaner. How to Use It. Testing Your Base Cleaner’s pH Level. Finding pH Strips. Making a Base Liquid pH-Balanced Laundry Soap. That’s a pHact, Jack. How to Use Your Laundry Soap. Making a Base Surface-Cleaner Spray. How to Use Your Surface-Cleaner Spray. Making a Base Floor Cleaner. Nonwooden Floors. Wood, Laminant, and Marble Floors. Making a Base Carpet Shampoo. How to Clean with the Shampooer. Making a Base Carpet Spot and Stain Remover. How to Use Your Carpet Spot and Stain Remover. Making a Base Glass Cleaner. How to Use Your Base Glass Cleaner. In the Newspaper. Window Washing Rules. Making a Base Disinfectant Surface Cleaner. How to Use Your Disinfectant Surface Cleaner. Making a Base Abrasive Toilet Bowl Cleaner. How to Clean the Inside of the Toilet Bowl. Making a Base Rust and Mineral Stain Remover. How to Use It. Making a Base Mold and Mildew Remover. Prevention Is Best. How to Use It. Making a Base Oven Cleaner. How to Use It. Make Your Own Supercleaning Citrus Fruit Enzymes. Fruit Enzymes. Does This Smell Bad to You?. How This Enzyme Recipe Works (From My Perspective, Anyway). How to Use Your Fruit Enzyme as a General Cleaner. How to Use Your Fruit Enzyme Cleaner as a Laundry Detergent Booster. How to Use Your Fruit Enzyme Cleaner as a Super Stain Lifter. Make Your Own Citrus Oil Extract. How to Use It. Make Your Own Plant Oil–Based Heavy-Duty Solvent. Why Castor Oil?. Castor Oil. How to Use It. Make Your Own Heavy-Duty Hand Cleaner. How to Use It. Make Your Own Green Furniture Polish. How to Use It. How to Remove Stains. Know Your Stains. Mechanics of Stain Removal. Know Your Basic Tannin (Plant-Derived) Stains. Know Your Basic Oil-Based Stains. Know Your Basic Pigment Stains. Know Your Combination Pigment and Oil Stains. Know Your Combination Protein and Pigment Stains. Know Your Unique Stains. How to Clean Odds and Ends. Home-Friendly Green Pest and Weed Control Projects. Control Issues. Pesty Pesky Weeds. Weed the People. Make Your Own Weed Killer. Weed Killer Active Ingredient. Weed Killer Active Ingredient. Weed Killer Inactive Ingredient. Weed Killer Inactive Ingredient. How to Use It. Making Your Own Creepy Crawly Controls. Remember, It’s a Bug Eat Bug World Out There. Making Your Own Pest Controls. The Many Uses of Boric Acid. Shh … It’s a Secret. How to Use Boric Acid. Make a Puffer to Kill Roaches. How to Use It. Die Roach Die!. Make a Boric Acid Flea Control. How to Use It. Make a Boric Acid Ant Control. Making Boric Acid Chalk to Control Crawling Pests. Garlic as a Pest Control. Make a Garlic Concentrate for Multiple Pest Control Use. Make a Garlic Insecticide Soap. Make a Garlic Insecticide Flour Spray. Make a Garlic and Vegetable–Based Horticultural Oil. Make a Pepper Spray to Control Chewing Insects. Make a Castor Oil–Based Mole Control. How to Use It. How to Make a Beer Trap for Slugs. Stopping Slugs: Rough ’em Up. Capture and Kill Fleas with Christmas Tree Lights. What to Buy If You Can’t Make Your Own Pest Controls. Understanding All Types of Pesticide Risk. Read and Understand. A List of Pesticides That Contain Natural Ingredients. Just-for-Fun Projects and 101 Cool Tips. 101 Cool Tips from A to Z. Use Recycled Aluminum Foil to Quick Clean Your BBQ Grill. Making a Walkway from Used Brick Pieces. Making Old Candles into New. Making a Weed Block with Recycled Carpet. Clothes Hanger. Build a Recycled CD Scarecrow. Recycling a Garden Hose into a Soaker Hose. Make Outdoor Oil Candles from Recycled Glass Bottles. Making a Campfire Starter from Lint. How to Use It. Paper Egg Carton Planter. How to Use It. Make a Dog Training Device. How to Use It. Make Sun Tea in a Recycled Plastic Bottle. Make a Plastic Bag Dispenser for Your Car. Make a Cat Bed from Plastic Grocery Bags. Make Homemade Paper from Recycled Paper. Make a Pinata from Recycled Paper. Make the Pinata. How to Use It. Make a Device to Help You Park in the Garage. Make a Better Tire Swing. Make Seedling Starters from Toilet Paper Tubes. Build a Solar-Powered Hydrogen Firecracker. Direct Current Events. Got Gas?. Build a Wind-Powered Scarecrow. Making Money with the Items You’ve Made and Sources. What’s the Plan, Stan?. Who Else Is Out There?. Help Them Find You. Word of Mouth. Business Cards. Brochures. Direct Mail. Newspapers. How to Find Your Market. The Price Is Right. Up and Up. Places to Sell Homemade Products. Third-Party Sites. Having Your Own Site. Sources.